November 02, 2010 (KATAKAMI / THE JAKARTA POST) — President Susilo Bambang Yudhoyono is scheduled to fly to Yogyakarta later today to meet people displaced by Mt. Merapi multiple eruptions in the past few days. The President is slated to fly to Yogyakarta at about 2 p.m. Tuesday, after meeting with visiting Australian Prime Minister Julia Gillard, Tempointeraktif.com reported Tuesday. Yudhoyono earlier said that he had contacted governors of Yogyakarta and West Java, to make sure that people displaced by the eruption are taken care of. “I ordered (the two governors) to try their best to save the lives of our brothers and sisters around Mt. Merapi,” he said. He also called on the people to improve their preparedness in the face of multiple disasters, considering that Indonesia is prone to natural disasters. “We have to change the way we see disasters in this country. Our country is prone to natural disasters such as earthquake, tsunami and volcano eruption. When we are aware of our geography, we have to do whatever we can do for our survival to face these disasters,” he said. Yudhoyono cut short his visit to Vietnam and returned home to visit victims of tsunami disaster in West Sumatra last weekend, and flew back to Vietnam to attend the Association of Southeast Asian Nations (ASEAN) summit. 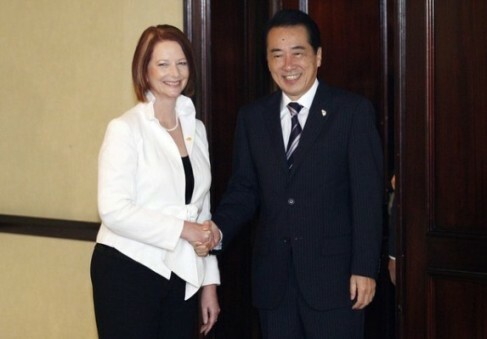 November 01, 2010 (KATAKAMI / VOA) — Australian Prime Minister Julia Gillard said on a visit to Malaysia that the two countries hope to reach a free trade deal next year. 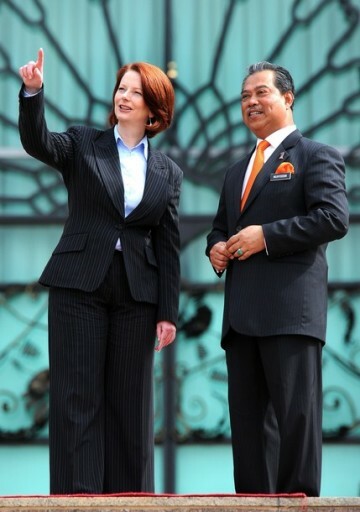 Ms. Gillard met Monday with Deputy Prime Minister Muhyiddin Yassin, standing in for Prime Minister Najib Razak, who is ill with chickenpox. Muhyiddin told reporters that he hoped the trade agreement would move forward next year and be signed as soon as possible. Ms. Gillard also called for a center to be set up in East Timor to process refugees and asylum seekers, mostly from Afghanistan and Sri Lanka, who use Malaysia as a transit point to Australia. Muhyiddin said Malaysia needs more information before coming up with an official position on the processing centers. 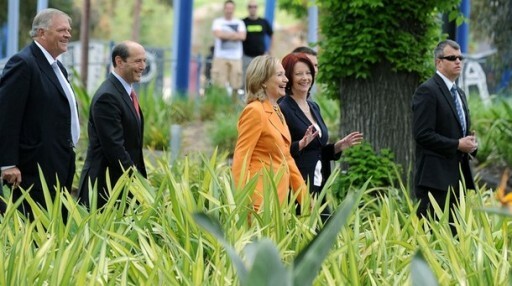 Ms. Gillard is on her first regional tour since becoming Australia’s first female prime minister earlier this year. She began her tour by attending the 16-nation East Asia Summit in Vietnam Saturday and was to travel on to Indonesia later Monday. 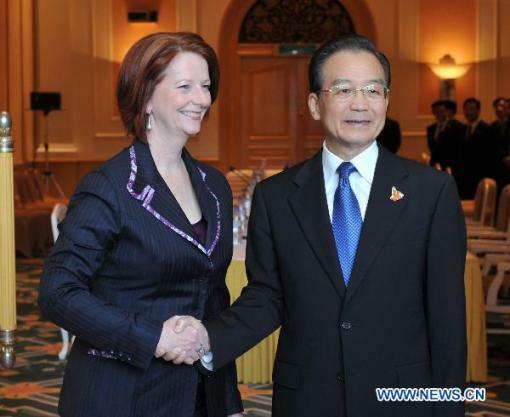 October 30, 2010 (KATAKAMI / PEOPLE’S DAILY ONLINE) — Chinese Premier Wen Jiabao and his Australian counterpart Julia Gillard promised in Hanoi Saturday that they would make concerted efforts to further promote bilateral relations. The two met on Saturday morning at the hotel where Wen is staying. They are both here to attend a series of summits between the Association of Southeast Asian Nations (ASEAN) and its partners. 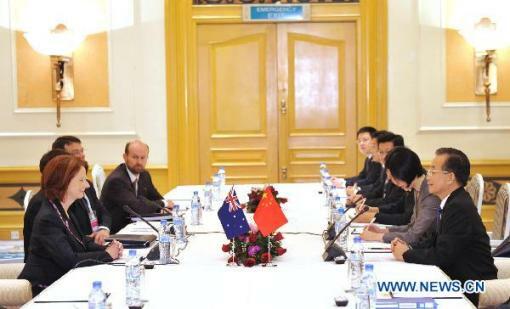 Wen said Australia is a big country in the Asia-Pacific region and the smooth development and promotion of bilateral ties between Australia and China benefit both countries and their peoples. “I am very glad to take advantage of this opportunity to exchange views with you on bilateral relations and issues of common concern,” Wen said. 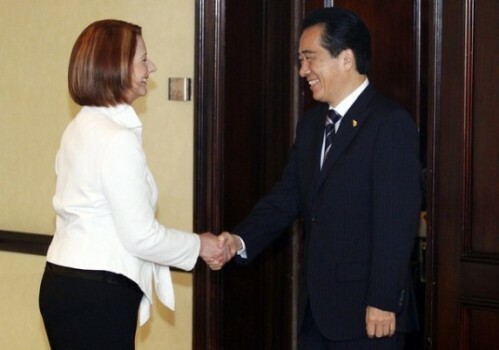 Gillard said that she was very delighted to meet with Premier Wen. She was content with the development of bilateral ties and would try to further promote this friendship. Wen arrived here Thursday afternoon to attend the summits between ASEAN and its partners. On the sidelines of the meetings, Wen has met with leaders of some countries and exchanged views with them on bilateral relations. (KATAKAMI / BBC) — One of four key independent lawmakers has pledged support for Prime Minister Julia Gillard, leaving her just two seats short of the majority needed to form the next Australian government. 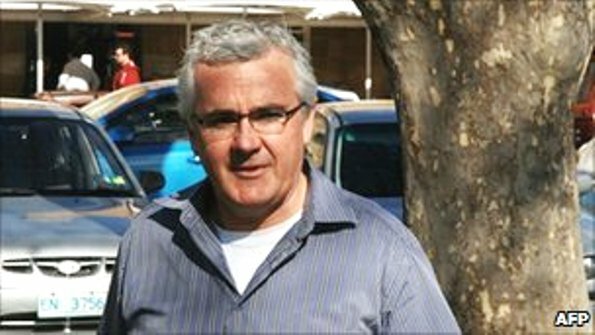 Andrew Wilkie, who represents Denison in Tasmania, said Ms Gillard’s Labor party was most likely to deliver stable government. Three other independents have yet to decide who to back. 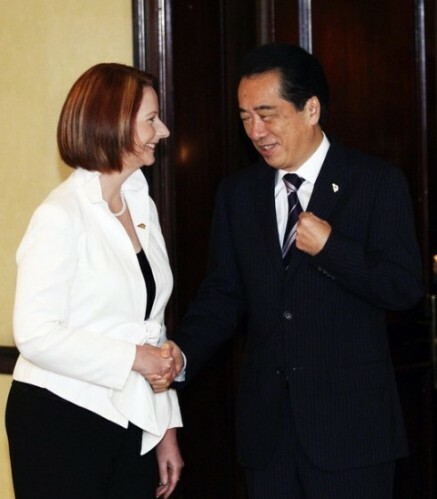 They have been in talks with both Ms Gillard and her rival, Tony Abbott. Almost two weeks after the 21 August elections, neither the ruling Labor party nor the Liberal-led coalition has managed to form a government. After Mr Wilkie’s decision Labor can now count on support from 74 of the 76 seats needed, with the coalition narrowly behind on 73. “I have judged that it is the Australian Labor Party that best meets my criteria that the next government must be stable, must be competent and must be ethical,” Mr Wilkie told journalists. He said Ms Gillard had agreed to a number of requests, including funding for the Royal Hobart Hospital and restrictions on poker machines, ABC news reported. The three independents who remain undecided, Rob Oakeshott, Tony Windsor and Bob Katter, are continuing to hold talks with both blocs. They have asked the coalition to explain what the Treasury says is a US$9.6bn (£6.2bn) hole in its election manifesto costings. Mr Wilkie urged them to act quickly. “I hope that this sends a signal to the other three independents and they move as soon as they can to make their decisions, and to decide to support a party or parties in a way that will bring stability to the parliament,” he said. (KATAKAMI / INDIAN EXPRESS) — Australian Prime Minister Julia Gillard forged an alliance with the Greens party on Wednesday to take her party closer to forming a government, but vowed not to allow the deal to change her plans for a tax on miners’ profits. Our election commitments are our election commitments, the Labor Party leader told a news conference. In the days since the election I’ve been asked will you change the Minerals Resource Rent Tax, and the answer of course is no. Labor’s widely expected agreement with the influential Greens party gives Gillard 73 seats in the 150-member lower house, bringing her level with the oppposition conservative coalition but still three short of the majority required to rule. A jostle for the support of four independent lawmakers who emerged from Aug. 21’s inconclusive election holding the balance of power could still drag into early next week. (KATAKAMI / SMH.COM.AU) — Prime Minister Julia Gillard will ask independents Bob Katter, Tony Windsor and Rob Oakeshott to release Labor’s and the coalition’s policy costings publicly. Ms Gillard said the three MPs were being briefed by Treasury and the finance department on the government’s and opposition’s policy costings as she spoke on Wednesday. “At the end of those briefings, it is my intention to ask the independents if the costings of government policies prepared at their request … can be released publicly,” she told reporters in Canberra. Ms Gillard called on Opposition Leader Tony Abbott to allow the public to see the coalition’s policy costings too. The prime minister also welcomed the deal she signed earlier with the Australian Greens, which secures their support for a Labor minority government. “I think the fact that we were able to reach that agreement shows that we have worked in good faith and held good discussions,” she said. In negotiating changes to the caretaker conventions that allowed the independents to have their Treasury briefings, Ms Gillard said Mr Abbott’s chief-of-staff had reserved the right for the opposition to have later briefings itself. The opposition would get costings support, “should the opposition require additional or revised policies based on negotiations with the independents”, she said. “Whatever Mr Abbott has said today in this correspondence is recognising the reality of the circumstances after the election,” she said. Ms Gillard said Labor was not in coalition with the Greens. “Mr (Adam) Bandt in the House of Representatives and the Greens in the Senate will make up their mind on propositions before the parliament,” she said. Ms Gillard said she hoped to secure written agreements of support from Mr Katter, Mr Windsor, Mr Oakeshott and Tasmanian independent Andrew Wilkie and WA Nationals MP Tony Crook. “Agreements in writing are important to transparency and they are important to certainty,” she said. Ms Gillard on Tuesday said she gave the rural independents a paper outlining Labor’s proposed parliamentary reforms. The prime minister didn’t intend for it to be released publicly but said the MPs could do so if they wished. “We didn’t in that process indicate to them that it was our intention to release it publicly,” she said. 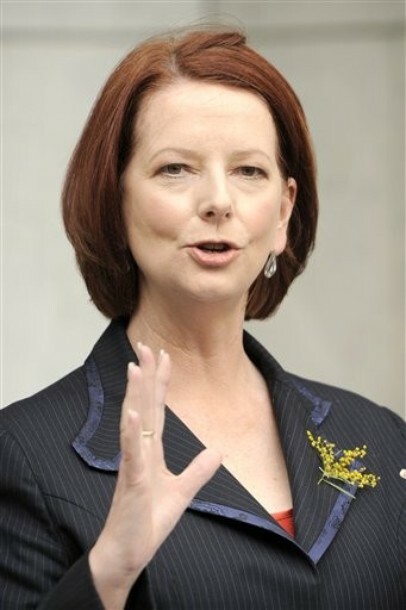 (KATAKAMI / BBC) Australia will hold a general election on 21 August, Prime Minister Julia Gillard has announced. 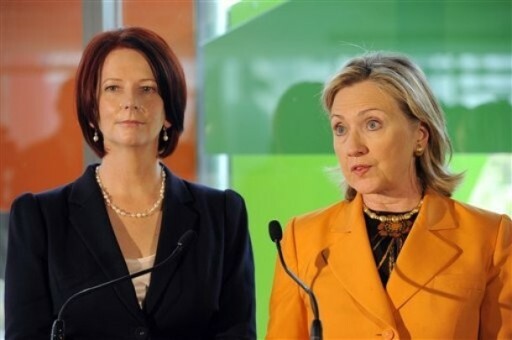 Ms Gillard – the country’s first female prime minister – said the snap poll would be “tough and close”. 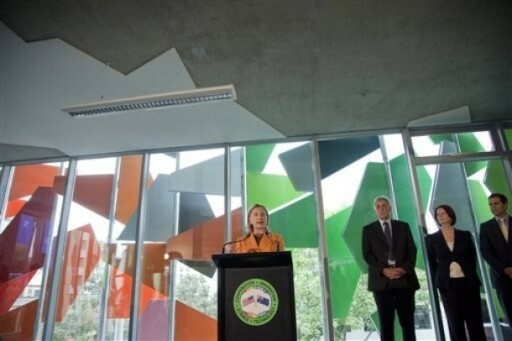 The governing Labor Party elected her as leader three weeks ago after ousting her predecessor, Kevin Rudd. The race between Labor and the conservative opposition Liberal Party is expected to focus on the economy, health, climate change and immigration. “This election is about the choice as to whether we move Australia forward or go back,” Ms Gillard said in a televised speech in Canberra. She said that it also “means moving forward with stronger protection of our borders and strong plan, a real plan, that takes away from people-smugglers and the products they sell”. Opposition Liberal Party leader Tony Abbott has dismissed the recent change of the Labor leadership, saying Ms Gillard was committed to the “same dud policies” of her predecessor. It will be the toughest fight in Ms Gillard’s political life, the BBC’s Phil Mercer in Sydney says. Recent opinion polls give Labor a lead over the Liberals and Ms Gillard will be hoping to secure another three-year term, our correspondent adds. 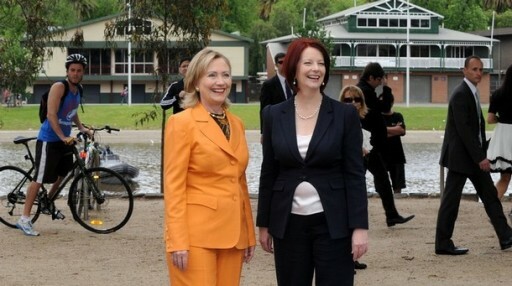 Ms Gillard became Australia’s prime minister last month after a surprise leadership vote saw Mr Rudd deposed. Mr Rudd chose not to take part in the ballot, knowing he would suffer an embarrassing defeat to his deputy. Labor has suffered a sharp drop in support in opinion polls this year. A U-turn on a carbon trading scheme and a wrangle over a controversial mining tax led to a sharp slide in approval ratings for Mr Rudd’s government. Ms Gillard was born in Barry in south Wales, moving to Australia with her family at the age of four. Australia’s new Prime Minister Julia Gillard on Monday unveiled her new cabinet, making minimum changes to the front-bench of her predecessor Kevin Rudd. Prime Minister Gillard promoted no fresh ministers to her cabinet and even dropped Rudd from the list. But she said she would offer him a senior cabinet post if Labour Party is re-elected at the looming election. 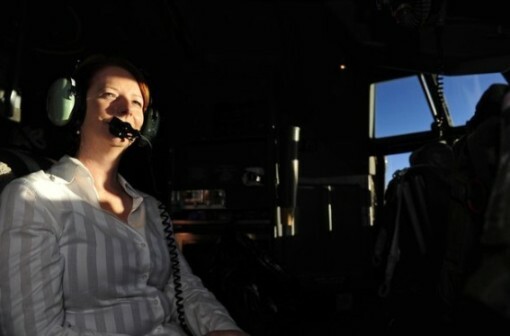 “It is best to have as limited a reshuffle as possible to keep maximum stability among the team and to keep our focus on the work that Australians need the government to be doing,” 49-year-old Gillard said. Gillard, who spearheaded the rebellion against 51-year-old Rudd opposing his policies on health, education and climate change, was last week sworn-in as Australia’s first woman Prime Minister. Former Trade Minister Simon Crean takes over Gillard’s portfolios of employment, industrial relations and social inclusion. Foreign Minister Stephen Smith adds trade to his portfolio. Gillard said the new government will be focused on delivering “hard-working Australians”, a strengthening economy and a renewed focus on services. “I am not making any assumptions about what will happen on election day. This will be a close hard-fought contest,” she said. In a statement issued after cabinet reshuffle, Rudd, who was forced to resign following revolt within ruling Labour party last week, said he respects Gillard’s decision. Meanwhile, Gillard said she had spoken to Rudd about his future and he had confirmed he would run for his seat at the next election. “Consequently, what I have said to Kevin Rudd is I would be absolutely delighted to see him serve as a senior cabinet minister in the team if the government is re-elected,” she said. 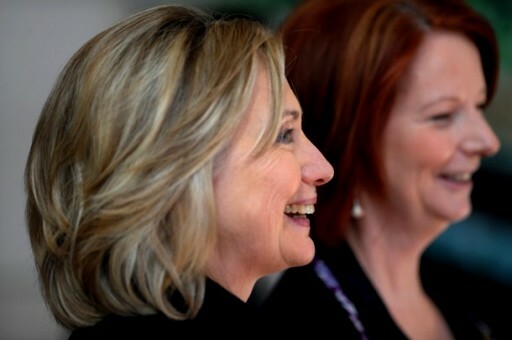 Gillard said she completely understood Rudd’s immediate desire to spend time with family. “What I’ve said to Kevin is, that I think that this is the best course and it would enable him, if he chose to do so at this time, to spend more time with his family which I know is one of his key priorities in life,” she added. Rudd, elected in 2007, had been one of the most popular Australian prime ministers of modern times until he made a series of policy backflips. 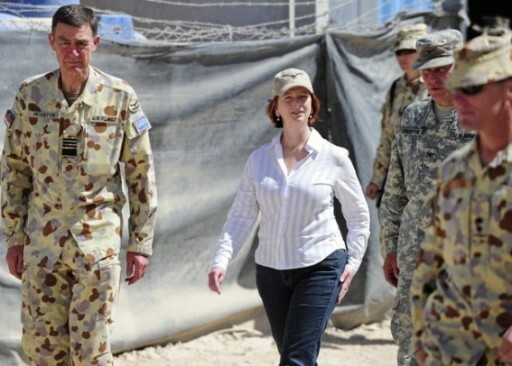 (VOA) New Australian Prime Minister Julia Gillard has reassured the White House that Canberra intends to maintain its military deployment in Afghanistan. On the first day in her new job, Ms. Gillard spoke with U.S. President Barack Obama to reaffirm Australia’s commitment to the war against insurgents. 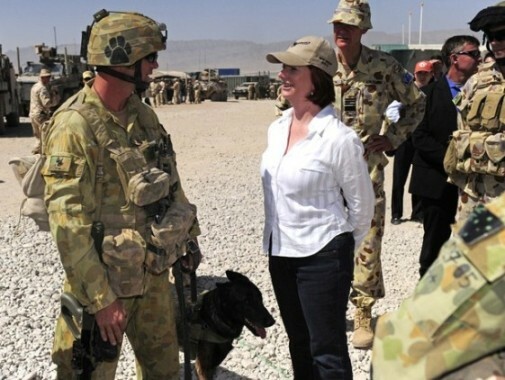 In a 20 minute telephone conversation Friday, Ms. Gillard said her government’s commitment to the U.S.-led campaign in Afghanistan would continue despite mounting public opposition to the war at home. Canberra has deployed 1,550 troops to the south of Afghanistan, including elite commandos, military training specialists and reconstruction units. 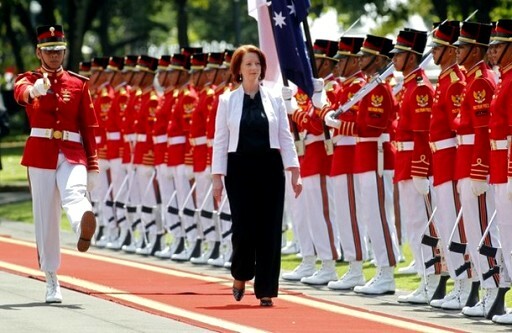 Ms. Gillard told reporters in Canberra that Australia remains committed to the war effort. Earlier this week, Defense Minister John Faulkner said Australia could start withdrawing troops from Afghanistan in two years if their mission to train local soldiers went ahead as planned. It was the first time a senior government figure offered a possible timetable on pulling forces out of the troubled country. Recent opinion polls have suggested that Australians are tiring of the distant conflict, especially after the deaths of three commandos last week. Sixteen Australian soldiers have died in Afghanistan. 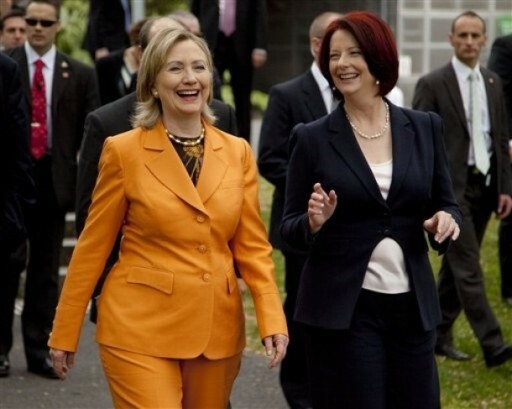 Ms. Gillard has said the alliance with the United States is the cornerstone of Australia’s security policy, pledging to strengthen during her tenure. The prime minister’s newly-appointed deputy, Wayne Swan, will represent Australia at a G20 meeting in Canada set to open this weekend. (Reuters) – Julia Gillard became Australia’s first female prime minister on Thursday when Kevin Rudd stepped down, as the Labor government sought to avoid election defeat later this year by changing leaders. Gillard is expected to present more of a change of leadership style than substance, but investors hope she will soften a controversial “super profits” mining tax, which is threatening $20 billion worth of investment and has rattled voters. The Australian dollar briefly jumped after the leadership change, while shares in BHP Billiton, the world’s biggest miner, and Rio Tinto rose around 2 percent, on hopes of a mining tax compromise. “The market is going to assume that the (mining) tax is going to be amended, and hence the worst case outcome they were staring at is not going to eventuate,” said Richard Schellbach an equity strategist at Citi. Rudd become the shortest-serving Australian prime minister since 1972, with his leadership falling apart after a string of poor opinion polls showed him losing ground over recent decisions to shelve a carbon-reduction scheme and impose a new mining tax. Government lawmakers believe Gillard has a better chance of winning back voters ahead of an expected October poll because she is a warmer personality who can sell policies more effectively. Miners have launched multi-million dollar advertisements warning of widespread job losses, spooking voters, if the 40 percent tax goes ahead in its current form in 2012. Global miners such as Rio Tinto, BHP, and Xstrata are expected to campaign strongly against the tax, if it is not changed, at the next election and help a resurgent conservative opposition’s bid to oust Labor. “If they’ve gone to the trouble to put a new leader in to get their re-election chances up, then obviously they’re going to water down the mining tax as well — all part of that strategy to shore up voter support,” said Mark Taylor, senior resources analyst at Morningstar. Despite investor hopes that a leadership change might spell a major backdown on the mining tax, left-winger Gillard’s backers expect her to mount a much more effective defence of it. Some economic analysts expressed concern over Gillard’s left-wing, trade union background. “Clearly this is a positive for the Australian dollar and stocks in the short and medium term,” said Su-Lin Ong, senior economist at RBC Capital Markets.